City of Brass, a first-person action/adventure game with rogue-like elements, is due to be released in early May for PC, PlayStation 4 and Xbox One. We’ve contacted Australian independent studio Uppercut Games, formed by several former Bioshock developers, ahead of the upcoming release to learn more about the game. 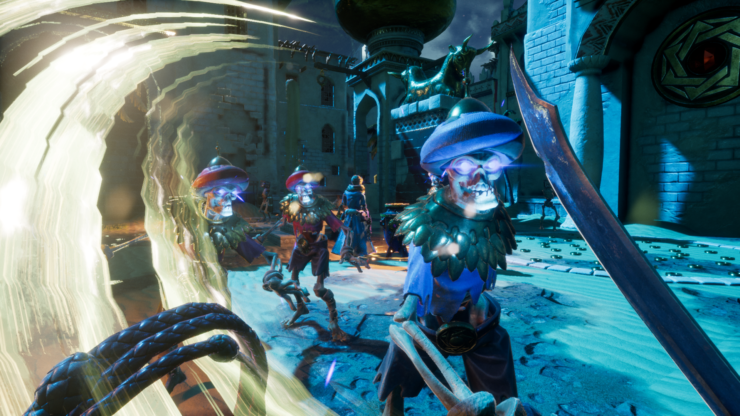 As usual, we’ll start with an excerpt where Co-Founder and Director Ed Orman gives us the lowdown on the technical specs of City of Brass running on consoles as well as a comment on the likelihood of a Nintendo Switch port. The game has been confirmed to be enhanced for the Xbox One X. Can you tell us the full specifications of this version as well as your thoughts on the hardware as a whole? With an Xbox One X, the game will output HDR10 if your TV supports it. It’s also got 4K resolution, higher quality lighting and higher quality shadow resolution/draw distance. And of course, the framerate is higher. Basically, the game just looks and runs better. Will City of Brass also be enhanced for the PlayStation 4 Pro? If so, how does it compare in terms of specifications (frame rate, resolution, settings etc.) to the Xbox One X version? The PlayStation 4 Pro version runs with a similar level of quality to the Xbox One X, but without the HDR – that’s something we’re hoping to patch in at a later date. Also, the resolution on PS4 Pro is 1080p just like on PlayStation 4 and Xbox One. Do you have any interest in exploring a Nintendo Switch port for City of Brass? I love my Nintendo Switch. And the Unreal Engine supports Switch, so it’s something we are considering for the future. Check back tomorrow to read our full chat with Ed Orman about City of Brass (already available on Steam Early Access, by the way).